Erik Weihenmayer has been blind since age thirteen. In 2001 he became the first, and thus far only, blind person to reach the highest peak in the world when he climbed to the top of Mt. Everest in Nepal. One year later, when he stood on top of Mt. Kosciusko in Australia, Weihenmayer completed his 7-year quest to climb the Seven Summits – the highest mountains on each of the seven continents, joining only 100 mountaineers who have accomplished that feat. We can stand in awe of this man and speculate what might have motivated him to accomplish such an incredible feat. There is another man who climbed to the top of a hill outside of Jerusalem, a hill named Golgotha. While the ascent was not nearly as high, and the circumstances were much different, what was accomplished on top of that hill is of far greater importance, and accomplished far more than we can fully fathom. Perhaps Erik Weihenmayer was motivated by a desire for self-satisfaction. Our Savior’s motivation can be found in the words recorded for us in Matthew 9:35 ff. : “But when He saw the multitudes, He was moved with compassion for them, because they were weary and scattered, like sheep having no shepherd. Then He said to His disciples, ‘The harvest truly is plentiful, but the laborers are few. Therefore pray the Lord of the harvest to send out laborers into His harvest. '” Compassion! That is what motivated our Savior to leave His almighty throne on high and to do the self-sacrificing things He did. As our Savior looked out over that crowd, He saw the deep sense of guilt that comes from a life of sin and selfishness. He saw the heartache and disappointment that is experienced by all who do not know of the forgiveness that is promised to them by a gracious God. He saw a hopeless, helpless, heap of sinful humanity going every direction in search of something, being led by nothing but their own sinful flesh. But notice what our Savior didn’t do. He didn’t wag His finger at the crowds and tell them to shape up and get their lives in order so that they could earn a place in heaven. He knew this would be a command that could never be met. He knew that among these scattered sheep there was none who did good, no not one. But instead of seeing a hopeless situation, our Savior, through His eyes of compassion, saw a harvest field ripe for the picking. And so Jesus told His disciples to pray to the Lord of the harvest to send out laborers into His harvest. Because of Christ’s compassion for lost sinners, the Lord has been petitioned time and time again by His redeemed children to open wide the doors of opportunity for the spread of the Gospel, and to provide workers to bring in the harvest. The Lord has been faithful beyond what any of us could imagine. Thanks be to God! Mount Zion, Detroit, MI: The members of Mt. Zion are thankful and happy that they will finally be occupying their own worship facility. Pastor and Mrs. Walter Schaller have just moved to the renovated church basement apartment, and the first service will be held on October 5. A formal dedication is being planned for November. They are looking forward to getting to know their neighbors, and to the prospect of conducting outreach in the immediate area. Ascension, Tacoma, WA: With its conducive location and ambitious outreach program, Ascension continues to have good success attracting visitors. Pastor Paul Naumann reports first-time visitors in church nearly every Sunday. There have been modest gains in congregational membership recently (just under 40 souls). Since its construction in 2003, the new church has seen a number of weddings and baptisms, and this past May observed the first confirmations in the new building. Meanwhile, Ascension received the gift of a baptismal font from Messiah/Eau Claire, and stained glass artist Dot Abbott continues to add new panes to the now nearly-completed window project. St. Paul, Vernon, BC: Pastor David Reim reports that the morale of the people at St. Paul is good. This is in spite of the fact that their long-term search for affordable property has not succeeded so far. Though financial pressure increases when the monthly subsidy from the synod is reduced each January, the members have expressed their satisfaction in knowing that the resources are being used for the Lord’s purposes elsewhere. Shepherd of the Valley, Weslaco, TX: The Lord has seemingly opened a door for the work here in the Rio Grande Valley. On September 12th the first of what we here pray will be a long running program aired on a local radio station. Pastor Gurgel can be heard for 15 minutes every Friday afternoon 5:15-5:30 p.m. on this radio station, which reaches across the valley and most likely into Mexico as well. While the message is not in Spanish, the message will reach many listeners who understand English. Through this program we are reaching into the Hispanic community – which has been a long-time desire among us in the CLC. We know that the Word of our Savior Jesus “will not return unto Him void, but will accomplish the purpose for which it was sent.” While it is our desire that our Lord would bring individuals into the church here, the more important desire is that He would bring into eternity many who hear the truth through this effort. We are called only to sow the seed, and to water that which is sown and wait for the Lord to grant the increase. On a lesser note, due to Hurricane Dolly the church sign blew down, and we are nearing completion of redesigning and repainting it. There will be a picture of it on our website shortly. We continue to be witnesses of our Lord Jesus in our corner of the world where He has called us to so do. o Austin and Detroit Lakes, Minnesota, decided to try “something different” this summer and chose not to utilize the TVBS program. o Weslaco, Texas requested a team to distribute fliers with information about the church there. About 2,500 flyers were distributed by the team that went to Texas. o Stambaugh, Michigan, took one step toward running its own VBS program. The congregation did their own flyer distribution, handing out 1000 flyers. The Committee sent a team to teach there three weeks later. The week saw an average of 9 children attending, 4 of which were nonmembers. o Middleton, Wisconsin, had a flyer team spend two days distributing 4,500 flyers. The VBS program sent a team that taught an average attendance of 14, of which 4 were non-members. o Spring, Texas, was the spot where the TVBS Committee was most focused this summer. Approximately 8,000 flyers were delivered. The average attendance for the week was around 30, of which 28 were non-members. o Lawrenceville, Georgia, requested help distributing flyers this year. A team went and passed out approximately 7,500 flyers. These flyers resulted in nearly doubling the usual attendance, to 27 students. One young 5-year-old and his family of four have since become members of the congregation. o A beneficial trend in the program has been the adoption of congregations in need of VBS help by another individual congregation. The TVBS outreach, with effort by all, serves to benefit all involved. We thank the Lord for His blessings and work through His people in the TVBS program. New U.S. Mission? – It has been some time since the Mission Board has expanded our home mission program by supporting a new domestic mission congregation. One of the reasons for this has been financial; it has been a challenge to support two full-time overseas missionaries, rather than one. For about two years, Grace Lutheran of Fairbanks, Alaska has been applying for mission status and support. We hope to be able to respond to this or other requests in the future. Meanwhile, we are happy to note that individual CLC congregations have been seeking to support “daughter” congregations, apart from involvement with the Board of Missions. These include startup congregations and preaching stations in Chaska, MN, Monterey, TN, Orlando, FL, Liberty, MO, Sioux City, IA, and Cleveland, OH, among others. Committee on Domestic Fields (CDF): Having completed the visitation of all our CLC missions for an outreach seminar, this committee now plans to follow up by fostering communication between our mission pastors to share ideas and information regarding congregational outreach efforts. Pastors of self-supporting churches will also be invited to participate. Personnel — Missionary David Koenig, having recently concluded his semi-annual furlough here in the States, made a return trip to India with a stop-over in Africa. While in Africa he visited our sister church body in the Democratic Republic of the Congo, as well as a contact in South Africa. He has now returned to his home in Chennai, India. On October 19th he will travel to Myanmar (Burma) to represent the CLC on a visitation with the UMELC. He plans to use his annual vacation time to visit family in the States around Christmas time. Following his vacation he and Mary will return to Chennai. Missionary Matthew Ude reports that things have become much easier for him in India as he has settled into more of a routine and has become more comfortable with the culture and ways of life in India. During the past several months he has visited and taught at each of the fourteen districts of the BELC, and visited the CLCI twice. In November he plans to visit our sister church bodies in Nigeria, Togo, and Ghana as he returns to the States, where he plans to spend his annual vacation time with family. On his return route to India in January he will meet Pastor Ohlmann in Nepal. CLCI, India – On May 26th the CLCI celebrated the 10th graduation ceremony of the CLCI seminary. Ten individuals were given certificates to recognize their successful completion of the correspondence course in theology. Fourteen men were presented with diplomas after completion of four years of instruction at the seminary. Over 1,200 members and pastors from area CLCI congregations were in attendance. Missionary Matt Ude and Pastor Todd Ohlmann were also in attendance. As the Lord continues to bless this effort we pray that the Lord would send more workers to the CLCI seminary to prepare them for the great harvest of souls in South India. Next spring, the Lord willing, the CLCI will have 12 graduates. Currently there are 38 men enrolled. Missionaries Koenig and Ude will each visit the CLCI once each year. BELC, India – The BELC recently added a fourteenth district in Tirutani, and representatives have recently made initial visits to Bangalore in Karnataka state to visit with two groups of pastors who have requested training. Another group of pastors in Chengelput (a district south of Chennai) have requested training. These two districts, among other groups of pastors, have been told that the financial resources are not currently available to offer pastoral training in these areas. Seven lead pastors continue to travel to each district on a monthly basis to offer preliminary and on-going pastoral training. Pastor D. Paul Bakthavachalam, the chairman of the BELC, spends most of his time now teaching the majority of the courses at the Martin Luther Bible School in the Nagalapuram, as well as serving as pastor of his local congregation. 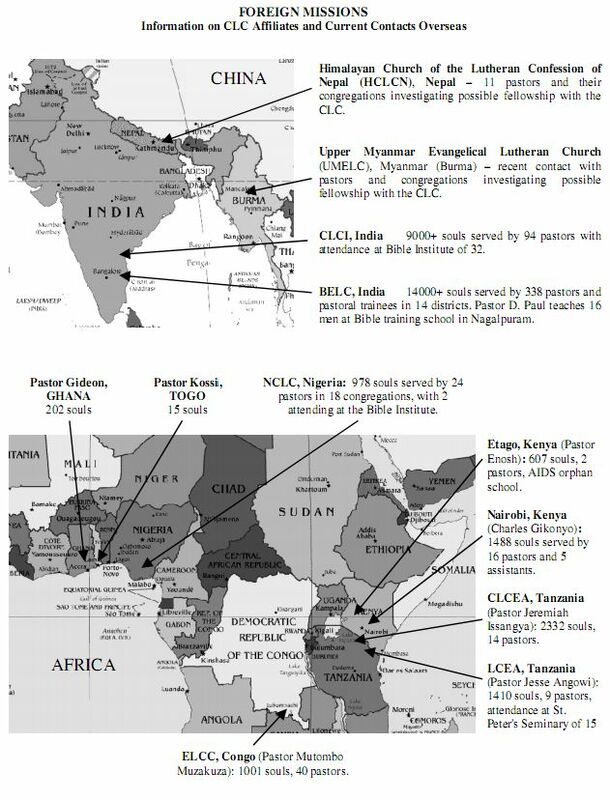 Missionaries Koenig and Ude continue to rotate through these districts to assist in the training of the more than 330 pastors who serve over 14,000 members. They are also working to develop a comprehensive curriculum outline for use in on-going pastoral training, both in India and in our other foreign fields. The seven district leaders meet in Chennai at the home of either Missionary Koenig or Ude for the monthly executive committee meetings, where they spend the day discussing the work of the BELC and encouraging one another in the ministry. During the most recent meeting in September, the district leaders discussed the possibility of visiting Jharkhand state in northern India where contacts have been made. They may make this a joint effort with the CLCI. They will discuss this further when the leaders of the BELC and the CLCI meet together on October 9-10. NCLC, Nigeria – Though we no longer have a full-time missionary in Nigeria, the leaders of the NCLC continue to train new pastors and maintain their current congregations, as well as fostering outreach efforts in Lagos, Port Harcourt, and Badagry. Pastor Patrick Johnny has returned from the Muslim city of Bauchi, where he had worked to establish a congregation, which was not successful. A new outreach to the city of Bayelsa is being considered. Pastor Patrick Udo and Pastor Edwin are the faculty of the Bible Institute. 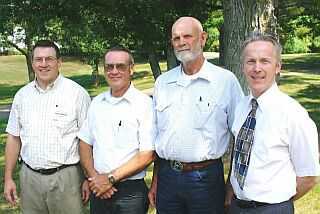 They recently graduated three men from the seminary, who will receive assignments to congregations. They are considering two new applicants for the coming year. We await the assessment of Missionary Matthew Ude, following his upcoming visits to Nigeria, Ghana, and Togo. East Africa – Within two weeks of this report, a three-man visitation team from the U.S. will be working with our sister churches in Kenya and Tanzania. They are Pastor Nathanael Mayhew, our part-time foreign missionary to East Africa, Mission Board Chairman Bruce Naumann, and Mr. Russell Schmitt, a lay member from Mankato who will be making his third volunteer trip to the area. They will participate in a pastoral conference to which leaders of the Lutheran Church in East Africa (LCEA), the Church of the Lutheran Confession in East Africa (CLCEA), and the Nairobi CLC are invited. We hope to foster a deeper knowledge of confessional Scriptural teaching at these meetings. It is also hoped that more fellowship and better communication can be achieved among these African churches. The visitation team will spend about a week in Etago, Kenya, to assist with the churches there and with the school for AIDS orphan children. We will then visit the churches under Pastor Jeremiah Issanga, and conduct pastoral training in Arusha. We will travel to St. Peter’s Lutheran Seminary in Himo, Tanzania, and celebrate with the people of the LCEA as St. Peter’s has its first graduation. Eight men will be entering the pastoral ministry. The Mission Board recognizes a pressing need for a full-time missionary from the U.S. in East Africa. We pray that the Lord will enable us to send such a man when the resources are available. We will endeavor to serve them as best we can, in the meantime, on a visitation basis. ELCC, Congo – On his way back from his U.S. furlough in early September, Missionary Koenig spent five days with the pastors of the ELCC, which is led by Pastor Mutombo Muzakuza. Besides teaching the pastors and catechists, Pastor Koenig met with and encouraged the ELCC’s translation committee in their work. They are translating various doctrinal papers into Swahili and French. Funds were delivered for Pastor Muzakuza’s circuit travel among his congregations. Building sites were inspected, which we intend to support with money for roofing materials. We are also investigating the possibility of sending Pastor Muzakuza’s son, Hubert, to St. Peter’s Seminary in Himo, Tanzania. Himalayan Church of the Lutheran Confession of Nepal (HCLCN) – Over a year ago, after contact was made via email with three CLC pastors, Pastor Ohlmann began corresponding with Pastor Raju Bhitrakoti, who is the son of Pastor JB Bhitrakoti from Nepal. After the first few email exchanges it became evident that Raju was sincere in requests for training. He mentioned that his father had received a Lutheran catechism and a couple of other Lutheran books and was convinced that Lutheran doctrine was Scriptural. Over the next several months Pastor Ohlmann led Pastor Raju, by email, through the adult instruction manual written by Pastor John Schierenbeck, entitled “Shadows and Substance.” Pastor Raju also shared the lessons with his father and his brother, as together they compared the lessons and Pastor Ohlmann’s comments with Scripture. Through this process they learned more and more and became convinced that the CLC was indeed a true teaching church body with whom they would like to work. With the approval of the CLC Board of Missions, Missionary Ude and Pastor Ohlmann traveled to Nepal in June of 2008. During the trip they visited several of the congregations and pastors associated with Pastor JB and his sons. On the last day of the visitation, nine independent pastors who work with Pastors JB and Raju gathered in Kathmandu to hear a presentation on the doctrine of the CLC. Pastors Ude and Ohlmann led the men through a presentation of the CLC’s Statement of Faith and Purpose. Throughout this presentation the point was made that our main concern is with teaching and proclaiming the truth of God’s Word. It was stressed that while the Lord has not chosen to bestow upon the CLC vast monetary resources, the Lord has blessed the CLC with deep theological roots and a heritage and history that values the truth of God’s word above all, and that we bow to no authority other than Scripture. They certainly got the message that being associated with the CLC would not result in a great influx of money to their church. Following the doctrinal discussions, an hour was set aside for Pastors JB and Raju to lead an organizational meeting with the other independent pastors who had gathered. After an hour or so of discussion by the pastors, a resolution to join together and form a confessional Lutheran church body in Nepal passed with a unanimous vote and enthusiastic clapping of hands and singing. They chose the name “Himalayan Church of the Lutheran Confession of Nepal.” Their first act was to elect Pastor Raju to serve as chairman. As chairman he was assigned the duties of continuing correspondence with the CLC, organizing and leading ongoing training of the pastors, and to begin the task of writing a doctrinal platform and constitution. After the 2008 CLC Convention approved the new “Nepal” line item in the MDF budget, $850 has been sent for the translation, publication, and printing of 1,000 copies of the “Shadows and Substance” adult instruction course. This project has been completed, and funding will now be sent for the nine pastors of the HCLCN to attend monthly training as they prepare to teach this course to the members they serve. Translation has now been started on Luther’s Small Catechism. Myanmar Visitation – On October 19th Missionary David Koenig, Mission Board member Larry Hansen, and Mark Bohde will travel together to meet with representatives of the Upper Myanmar Evangelical Lutheran Church (UMELC). This trip comes as the result of several months of email correspondence that was initiated by Rev. Thangkhankham Neihlai, the secretary the UMELC. Initial contact came via a letter addressed to the CLC Secretary. Pastor Ohlmann, on behalf of the Board of Missions, carried out extensive correspondence with Pastor Neihlai over several months time. The UMELC has recently written and sent a lengthy doctrinal statement for our review, and has requested fellowship with the CLC. We pray that the Lord would bless this trip with safety and success, so that the name of the Lord may be glorified. Mission Helper Trip to India, 2009 – Plans are taking shape for the next Mission Helper trip. Promotional materials have been sent to congregations, and several applications have been requested. To date, only three applications have been returned. There is space available for 12 to 16 volunteers. The Committee on Foreign Fields has also developed a website which will be up and running soon at: www.clclutheran.net/MissionHelpers. The many CLC volunteers who have made this trip in previous years have gone at their own expense, or have been sponsored by other individuals or congregations. They have found it to be hard work, but a very rewarding experience. Our Indian brethren have treasured their presence among them. Those who are interested in applying for this trip should contact Pastor Ohlmann, at (314) 517-0177 or by email: tohlmann [at] swbell [dot] net. Project KINSHIP – Jesus encourages us to “Let the little children come to Me, and do not forbid them; for of such is the kingdom of heaven,” Matthew 19:14. What an opportunity we have to do just what our Savior directs, with our support for orphans through Project KINSHIP. Not only are the material needs of these orphans supplied, but, more importantly, they are nourished with the Bread of Life. Besides the sponsorships of the orphans in India and Nigeria, KINSHIP supports orphans whose parents have died of AIDS in Etago, Kenya. This is done through a monthly subsidy. We’re also supplying the money for materials to build additional classrooms for the orphan school there. Four have already been built, and the fifth is in progress. Each classroom will accommodate about 30 children. Mission Helper Loren Hansen, who worked in the area in 2007, reports “The people here are very poor. There is no electricity. They use and re-use everything. But in the midst of all the poverty, the children are happy.” KINSHIP also oversees the sponsorship of seminary and Bible school students in India and Africa. Proposed Budget for FY10 – The monetary challenge which we face in our mission efforts for the next fiscal year is that of supporting the cost of two fulltime foreign missionaries from within our regular budget. During the current year, ½ of the cost of fielding our second foreign missionary has been covered through the Mission Development Fund, at Convention direction. Next year, the regular budget must accommodate the full load. In addition, there are modest increases for the regular subsidy of our affiliated Indian church bodies, the CLCI and BELC. Our request for funds in FY10 is $326,000, which is a $26,000 increase over the current year. MDF — The CLC Mission Development Fund has been instrumental in providing our outreach efforts with the needed tools to communicate the Gospel of Christ crucified throughout the world, as well as here at home. It has been the springboard for funds to field our second foreign missionary. It has helped us purchase and distribute thousands of Bibles and catechisms, in many languages. It has helped dozens of poor congregations to finish church buildings which their own hands have built up. It has provided self-help loans to scores of pastoral graduates, to enable them to find a source of ongoing personal income, so that they can also preach and teach among their impoverished people. Most recently, the MDF has funded the purchase of a 9-passenger vehicle for use by our missionaries in India, as well as by the people of the BELC. Please remember the Mission Development Fund in your personal giving, along with needs of your local congregation and the other CLC funds.